Preheat oven to 400˚. Cut off top of garlic head and drizzle 1 tablespoon of olive oil over cloves. Wrap top of head with foil and place in oven and roast until cloves are soft, 30-40 minutes. Remove and let cool slightly. Cut cauliflower into 1″ pieces. Combine roughly 3-4 cups of cauliflower with 1 tablespoon of olive oil in a casserole dish. Roast in oven for 15 to 20 minutes or until cauliflower begins to brown. Remove and set aside. In a sauce pan, add 1 tablespoon butter and squeeze out 4-5 cloves of roasted garlic. Mash garlic as butter melts. Add flour and let cook over medium-low heat for one minute. Whisk in milk and cook until bechamel has thickened. Remove from heat and melt in cheddar. Pour over roasted cauliflower. 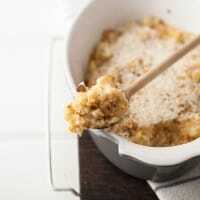 Combine toast, olive oil, and parmesan in a food processor, pulsing until mixture resembles course bread crumbs. Sprinkle on top of cheese/cauliflower. Bake for 20-25 minutes- cheese should be bubbling.